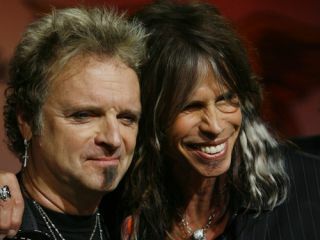 Aerosmith drummer Joey Kramer is backing the idea of the band's frontman, Steven Tyler, possibly joining the lineup of judges on American Idol next season. "It could be a good thing for Aerosmith," he tells MusicRadar. Kramer's view differs from that of Aerosmith guitarist Joe Perry, who was blindsided and angered by the news of Tyler's involvement with the show (and whether or not Tyler does, in fact, sit in a judge's chair is still up in the air: representatives for Idol have neither confirmed nor denied that a deal has been reached). "I know it's startled and upset some people," says Kramer, "but I'm trying to look on the positive side of things. If Steven joins American Idol, there could be upsides to it. Twenty million people a night would be exposed to Aerosmith via Steven. What's so bad about that? As long as it doesn't interfere with the band, I don't have a problem with it." Kramer's upbeat outlook is hardly surprising to anyone who's read his harrowing 2009 memoir Hit Hard: A Story Of Hitting Rock Bottom At The Top, which has just been published in paperback. In the book, the drummer recounts in excruciating detail his years of drug and alcohol addiction, as well as what he describes as a subsequent "nervous breakdown" brought on by depression and anxiety in 1995. Stays at rehab centers put Kramer back on track, but it's been a long road. "There were definitely days when I didn't know if I'd still be around today," the drummer says, "but I'm a fighter, so I chose to fight." "Ah, you know, it's all par for the course, man. One of the greatest things about being in this band is that you never know what's going to happen. There's always weird drama in the world of Aerosmith. I've learned not to be perplexed by it anymore. It's what makes us the band we are. "As for the American Idol thing and Steven, again, nothing surprises me when it comes to what he wants to do. And the big thing is, nothing's happened yet. We don't know know what's going to happen till it happens...and nothing's happened." "It was strange, yes. But things are always strange with us. You read my book, you know what I mean. Even when things get crazy, we still always manage to pull it together. Conflict and drama...it's par for the course. Things used to really upset me about the way we acted and the way things went, but I have a new attitude now and I've learned that you get through things." The band is back on tour, but once you're done in September, are you finally going to make a record? It's been a while. "It has been a while, and yes, we're going to start an album soon. A couple of years ago, we started to work with Brendan O'Brien, but we never got down to actually recording with him. We still have to decide on firm plans, but I'd like to make this next record the same way we did Rocks and Toys In The Attic. I want to make an old-school Aerosmith album." But that would mean you guys all writing it together and not relying on outside songwriters like you have since the mid-'80s. "That's true. It would mean us writing it together, playing together, being in the same room. I think everybody's up for that at this point. We did [2004's] Honkin' On Bobo that way, and that was a killer record. We just have to get down to being Aerosmith." Let's talk about your book, which I thought was absolutely gripping. What were your reasons for writing it? "I had many reasons for writing the book. There was the personal catharsis, of course - the wanting to get things out. But mostly, the idea was that I could help people. I thought to myself, If people can see that this rock star-guy is going through the same hell as they are, then maybe they won't feel so alone. "You don't have to be a rock star to crash and burn. Depression, anxiety, addiction - they can happen to anybody. It doesn't matter how much money you have or what kind of job you have. These are conditions that don't discriminate. "In that way, I never meant the book to be the typical rock star memoir - we've had so many of those. Sure, I put a lot of Aerosmith history and highlights in the book, but I never set out to write the 'Aerosmith story' per se; I wanted to write my story, with nothing but the truth on every page. And I wanted it to be a human story, something anybody can relate to. I'd like to think that you don't even have to be an Aerosmith fan to get something out of the book. You just have to be a human being." Aerosmith's history of drug and alcohol problems are the stuff of legend, but I was amazed at just how many chemicals you were putting into your body at one time - and for so long. "It's pretty amazing, isn't it? I'm very lucky to be alive. The drug and alcohol addiction was one thing, but the point in my life where I was at my lowest was later on, when I had my nervous breakdown. I was emotionally bankrupt. I was clean and sober, but I was at a place in my life where nothing mattered. It's still difficult to describe the pain that I was feeling." Perhaps your breakdown was brought on by just that - that you were actually feeling and being open to your emotions without numbing yourself with chemicals. "I was feeling the pain all right. And the people who treated me told me that not everybody comes back from it. Well, I wasn't about to let that happen, so I fought. It's a very mysterious thing, depression. I don't know if you ever lick it entirely. There are times when I can feel little things happening inside me, and I have to beat them down and fight them away. Luckily, I have to tools to do that. It's not easy. We're all human. "Learning how to talk to yourself is very important. I go into this in the book, how right after I came out of treatment I went back on tour - a big mistake, as I still needed time to regroup. And I remember I'd be getting ready to go on stage and I'd start to feel anxious. Not the normal kind of nerves you might feel in a situation like that; this was much worse. So what I did was I'd shut myself in the bathroom and talk to myself: 'OK, what are you afraid of? What are you really feeling?' The self-talk has really helped me so much." What has the rest of the band said about the book? "Not much. [laughs] I mean, they said they were proud of me for writing it. They know the book is true - they were there during all of it, so they would know if it wasn't." Has your new mindset extended to your drumming? Do you have any new practice routines or pre-show warm-up rituals? "I never warm up before shows. That's what the first two songs are for! [laughs] The first two songs are my warm-ups. I just make sure that I don't go on hitting at 100 miles per hour. You have to let it happen naturally, and then you're good to go. I used to spend half an hour playing backstage and warming up, but I found that to be fruitless." Are there elements of your playing you want to improve? Things that you haven't quite nailed? "Well, you never really get there. If you fall in love with music, it's a lifelong thing. But I've found that becoming more comfortable in my own skin and being able to relate to people better has had a real impact on my playing. The only way to play well is to be relaxed, and the only way to be relaxed is to feel comfortable in your own skin. It all ties together. Are you still playing DW Drums? "Actually, no. I went back to Ludwig. DW makes a really nice product, and I was with them for a long time. But over the years, I started to feel like a small fish in a big pond. My relationships with some of the people...They've just gotten really huge. At the same time, I became very impressed again by what Ludwig was doing. I went out and bought a Vintage Classic kit and thought it was great. So I'm going to be repping that line for them. It's a great set. The minute I started playing it I fell in love with it. My involvement with Ludwig will be announced pretty soon." Actually, I think it just was.